Asiana are full members of the Star Alliance, and as such at checkin will recognise all elite members of the Alliance: you won't have to queue for the "Travel" or economy class queue. You need to bring your card with you however: Asiana try hard to police their queues, and you will be turned to economy if you can't prove you are in a premium cabin or with the right type of card on you at the time. There is proper priority boarding, even at Heathrow, for Business Class and Star Golds (plus Special Needs and Families), which starts half an hour before the published push back time. Newspapers are on a trolley at the door. Service on Asiana is a unique Korean variant of the Asian service model: it's either charming or annoying, depending on your athetic principles. The big plus point is that the staff are very attentive, and will for example always top up your glass if it's half full. This can however become annoying if you just want to watch a film. The staff can sometimes also seem even more robotic than on Singapore (which is saying something) because they will always go through the mechanical process of offering you wine to taste (in Business) and showing you the label as you drink it: there is little room for flexibility. However the first few times you encounter this, it is quite charming. 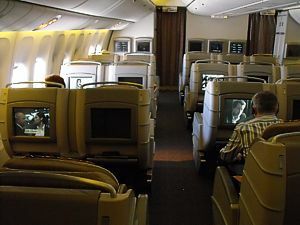 Longhaul in Business Class as you sit down the crew will hover and hang your jacket (although there is a hook on the seatback for this), and then come around with trays with water, orange Juice, or Sparkling Wine. After takeoff on late night flights, such as the LHR departure, the crew will work fast to server dinner very quickly to maximize sleep for passengers - and themselves. Menus and hot towels came quickly and are followed by the orders being taken for food and the first drink. Menus are always taken away at this point - you need to hide yours to hang onto it, even though it contains the tasting notes for the wine. A curious lack of understanding of western meals also comes to the fore with, you've guessed it, wine. When your drink order is taken on takeoff, it is assumed that you will stick with it for the duration of the flight. There is no understanding of the usual order of Sparkling Wine, cocktails, and then a different wine for each meal, ending with the port. If you do try this, it utterly throws the crew, who make frantic scribbles in their lists as to what you are drinking. There service pattern is equally unusual. Two crew man a trolley down the left aisle first serving drinks and Western starters, then return back down the aisle to repeat the process on the right side. Then on the left another crew member commences the Korean service (often with no starters). So to get served early, and get your choice, sit on the left, and take the Western meal. Later a cheese plate comes round, with a bottle of port. Then dessert, and so does the brandy with coffee. After diner is cleared, it is completed by more hot towels and water bottles being handed out. The second meal service commences two hours before landing at Seoul. 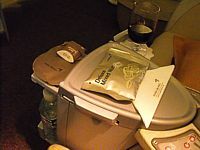 Even on night flights, when you are waking up, this is generally lunch or dinner. As a results, so it doesn't feel too odd, you may want to wake up an hour earlier, and get the crew to bring you a cup of tea. In business you also get a pillow (a smallish yellow rectangle thingy with not a huge deal of padding) and a blankets (a very thin grey 'staticy' affair). 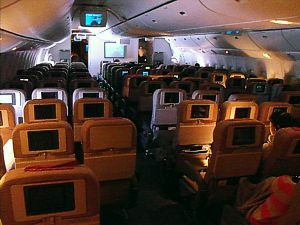 Longhaul in Economy (or Travel Class, as Asiana call it) service is a cut down version of economy. There are hot towels before the meal service and before landing. There are two trolleys that go down both isles, and which also serve the drinks. There is a second drinks run, but after that you have to visit the galley for top-ups. Bottles of water are handed out overnight. Business class has a great amenity kit, with a leather pouch containing toothbrush and paste (branded Asiana), earplugs (Again with the Asiana logo), three Biotherm tubes containing clarifying lotion, lipbalm and moisturizer. Plus an eyeshade. It's all contained in a good plastic washbag. However getting this kit can be a bit hit and miss: on some flights the crew miss handing it out althogether, and on others it comes around on a trolley, but you must be in your seat when the trolley comes around, or you'll miss out. 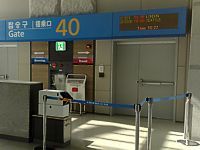 As an economy measure there is no kit stocked inbound to Incheon on any flight nowadays: it is only carried from Seoul. On night flights where the kit isn't handed out the crew will instead give you earplugs and a nightshade, which are put into the lowest pocket infront of you, along with the Asiana slippers in a plastic packet, plus the headphones. The middle pocket is used for the washbag, and the top shelf normally has a bottle of water on it. 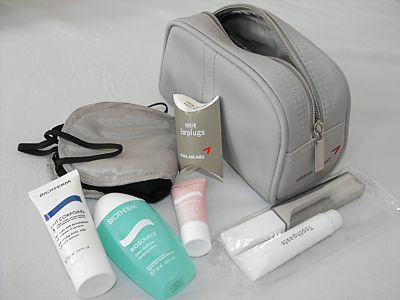 Asiana Airlines First Class provides a Bvlgari amenity kit, with similar (but more expensive items), including H2O body butter, face hydrating treatment, colgate toothpaste, facial Tissues and a small bottle of Scope. These retail for quite a lot on Ebay. In First you also get pyjamas. One other thing you should watch out for is the First Class gift: quite often these can be things like a Versace Coffee mug. In economy there are no amenity kits, however there are toothbrushes and combs in the toilets. Asiana has a pretty standard baggage allowance for each flight. Cabin Bags: Economy Class passengers can take hand luggage of one bag weighing up to 10kgs (22lbs), business and first class can take two. They must be no larger than 40cmx55cmx23cm. Rules on contents (such as liquids) apply. Check in luggage: On all routes except to the United States economy class can check in one bag weighing 20kg (44lbs), business class can check in two bags up to a total weight of 30kg, and First class can check in three bags up to 40kg. Routes to or via the United States have a baggage allowance of two bags, with economy allowed to 23kg (50lbs), business and first class with 32kg maximum. Silver (and Star Alliance Silver) Frequent Flyers gain an extra 10kg checked in luggage allowance, Gold (and Star Alliance Gold) gains an extra 20kg of checked in luggage allowance (or one extra bag if via the US). As always, these rules can change. Asiana's website has details of exactly what you can take onto a flight.